The Wicked Boy will be published Tuesday, July 12th! The Wicked Boy by Kate Summerscale. Penguin Press, 2016. Ebook. 352 pages. Despite its fascinating premise, I'm sorry to say that The Wicked Boy did not live up to my expectations. The story setup is fascinating: an investigation of the child murder case in which Robert Coombes murdered his mother, was found guilty, and was sent to an infamous criminal asylum. Was Robert mentally insane when he killed his mother? Was he influenced by the world around him and the 'penny dreadfuls' he was so fond of reading? What caused this horrific murder? I was so excited to dig into this intriguing historical case, but I had an extremely difficult time even finishing this book; most of the time while reading it I found my thoughts starting to drift off, which is never a good sign. Her writing is rather matter-of-fact, which wasn't actually the entire problem, but it certainly contributed to it. On the one hand, this rather blunt writing style fit the eeriness and cruelty of the story of the murders, but on the other hand it made what could be a fascinating story somewhat lifeless and forgettable. There's not really any mystery to the story since the crime is admitted and we know how it plays out. Because of this, the story itself needed a bit more intrigue and suspenseful writing, which it lacked. Similarly, I feel like there was a great deal of padding throughout the story, particularly in the latter half. Now, if you're someone who is interested in historical and/or criminal cases and don't mind reading a more academic-style narrative, then you might really enjoy this and find it quite fascinating, so I would encourage you to pick it. What I did really enjoy was the information itself: the mental health system, the culture of the period and location, and the profiles of those involved with the story. It is clear that Summerscale performed thorough research and put a great deal of time and effort into this, which I certainly commend her for. If the information had been written in a slightly more appeal or captivating manner, I think this book would have easily been much more enjoyable, but unfortunately it lacked the intrigue I needed. 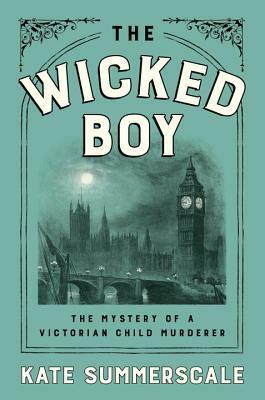 Overall, I'm giving The Wicked Boy two-and-a-half stars, because despite the intriguing premise and well-researched information premise, the book lacked any drive or passion and thus made this quite a slog to get through. What a bummer! It sounds like it could have been so good. I know! I was hoping for a lot more. I've heard she has a few other books that are really good, though, so I might see how those are.